Let’s get your copy of SyringePumpPro installed and activated. 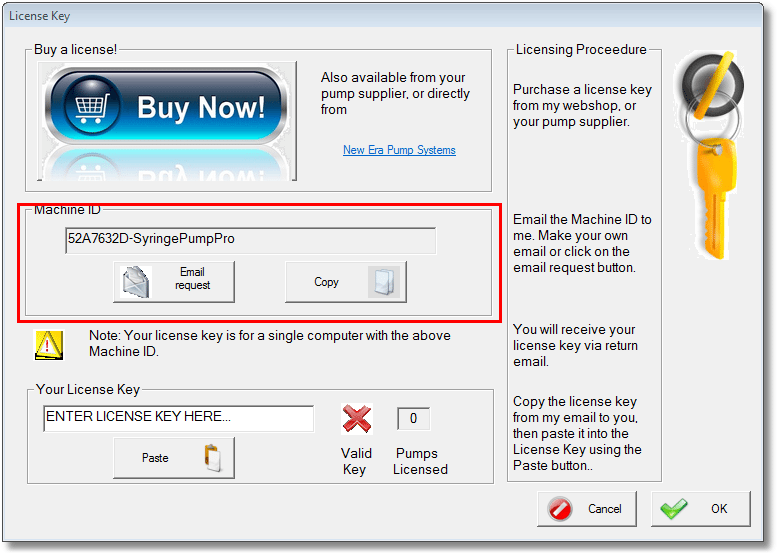 Download SyringePumpPro from the SyringePumpPro website. The try version is the full version of the software, which your license key will unlock. Install the software on the computer to be used with your syringe pump(s) connected. Your purchase is for one license key assigned to the computer you nominate. It cannot be moved. The license key dialog will appear. In the red square click the Email request button. An email window will appear. Please fill in your name and company/institution details, and your agent’s name and order number if you have one. Send the email when you have finished. If you don’t have email software configured on the computer you are using, copy the MachineID from the box and contact me. Don’t forget to include the your name and company/institution details, and your agent’s name and order number. I will generate your license key and email it to you – typically within 24hours. Paste/type your license key where it says ENTER LICENSE KEY HERE. If your key is entered correctly you will see a tick and the number of licensed pumps. That’s it – your done!